For those of you who read my last article, you know a little bit about how complicated the term “season” can be. Currently, New York Fashion Week is happening, but the garments going down the runway aren’t spring collections–at least, not spring ready-to-wear. 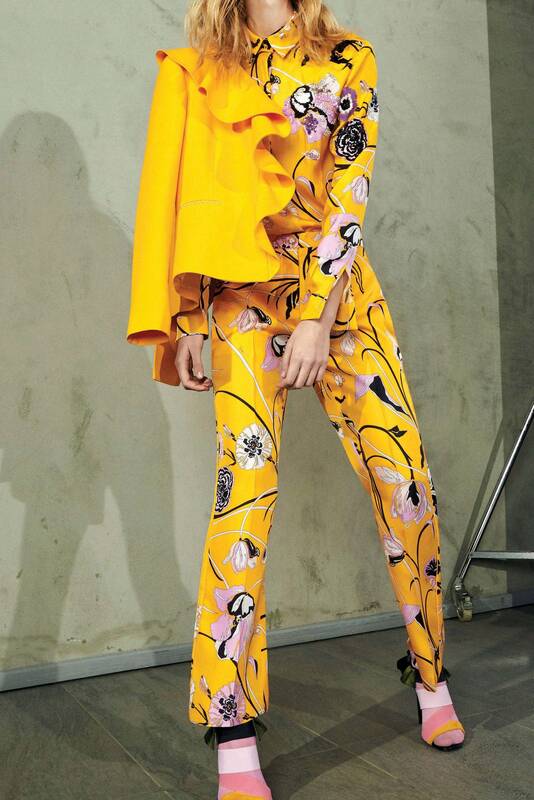 Ready-to-wear collections are meant to be the clothes that someone would wear on an average day. The fashion calendar is organized so that these collections are shown in advance, that way you have time to look them over and decide what you like before the actual season is upon you. Fast fashion’s choice to usurp this policy and, to the distress of the fashion elite, recreate things they see on the runway as soon as they are seen, results in the dismantling of this system. To understand more about how fast fashion impacts the industry, read my last article. 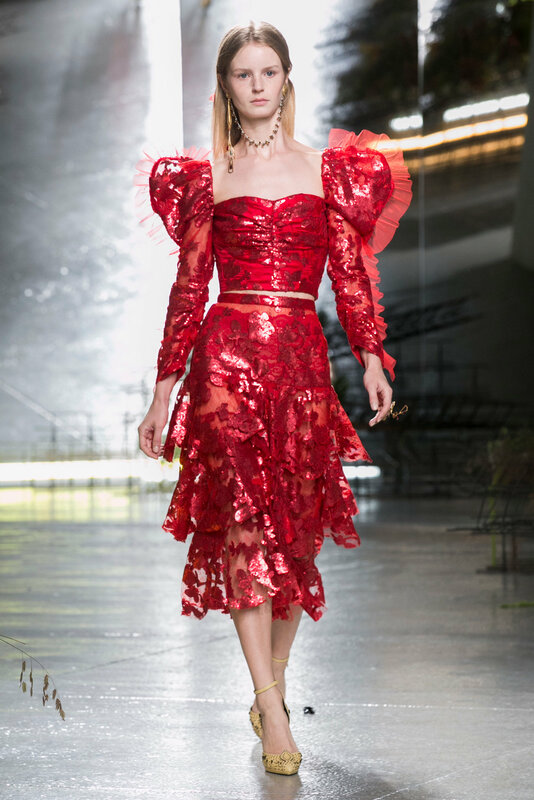 To act as a refresher and mind-un-boggler, I’m going to generalize here and show both my favorite pre-fall pieces happening now, and my favorite ready-to-wear spring pieces that are meant to represent what people will be wearing this spring. Stella McCartney (daughter of Paul McCartney and a recipient of the Most Excellent Order of the British Empire) has always had an aesthetic to her designs that communicates realism. McCartney makes clothes that are often as utilitarian as they are beautiful, not to mention how often they are designed with various advocacy movements in mind. Her spring 2017 RTW was full of paper bag-waist pants and jumpsuits, which are truly fantastic wardrobe staples. No one can tell how long someone wearing a paper bag-waist pant with a crisp shirt or a well-draped jumpsuit took to get ready, because the garments look coolly polished even if they were thrown on minutes before running out the door. Rodarte is leading the charge on the trend of puffy sleeves that continue to mark runways. Their spring 2017 RTW collection was interesting across the board for its bee themes (I could say it created a lot of buzz, but I don’t want to end my own life for being so corny), and a lot of their garments used layering and textures to mimick the pattern of honey combs. This dress was a particularly bold number for it’s color and shine, and its drips of where Queen Bee meets Queen of Hearts. 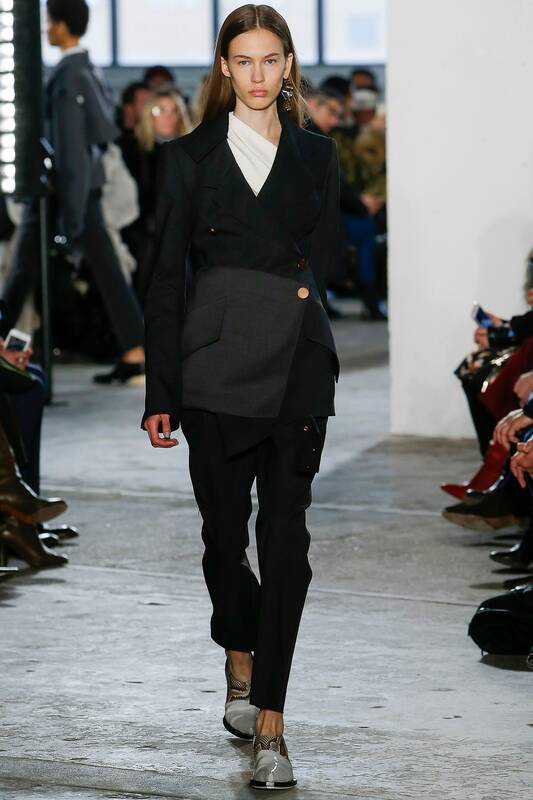 Founded in 2002 by designers Jack McCollough and Lazaro Hernandez, Proenza Schouler is a brand that, as per their site’s bio, “is defined by its fusion of craftsmanship and attention to detail with a sense of refined ease.” Their fall 2017 RTW meets this definition with trimmed designs that pull glamour from fine fabrics, and peripheral accents that evoke the same spirit as an extravagant cuff link or tucked-away ascot. With this look in particular, the softness of the white undershirt and flat, widening panel across the waist and hips give a nice balance to the overall masculinity of the suit. The slate patent leather and its reptilian trim act as a treat for a good up-and-down look of the outfit. Rosie Assoulin is new on the fashion horizon, and her designs are playful yet practical in a way that makes them a delight to the eyes. Markedly dreamy while still looking wearable, the spring 2017 collection (as well as fall 2017 RTW, an appreciation post for that collection will be coming soon) took advantage of big, bold patterns that were a marked trend of spring 2017 runways. 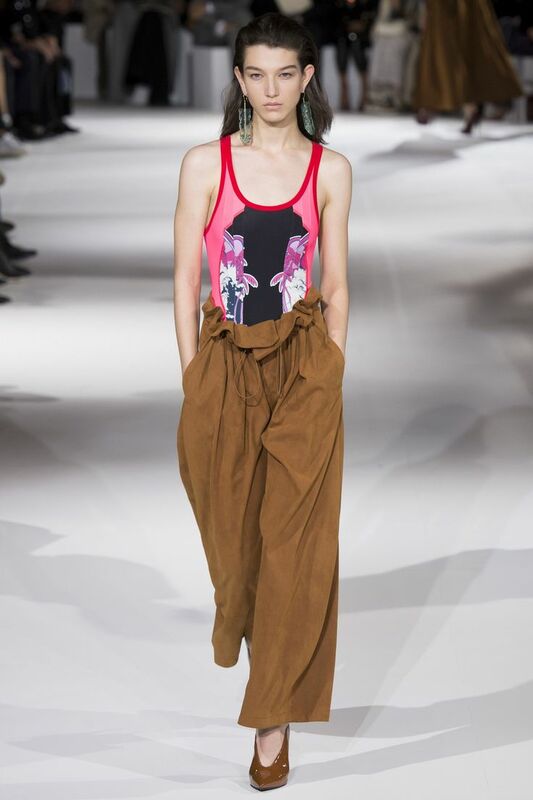 Overall, Rosie Assoulin designs are a godsend for daydreamer-types. This dress takes a preppy aesthetic and avoids the risk of looking uptight with a plunging neckline and a waterfall of sequins. If Proenza Schouler is about subtle fine details, Delpozo, the brainchild brand of the former Jesús del Pozo, currently led by Creative Director Josep Font, is about loud ones. Their fall 2017 RTW line featured bright bold colors and a some out-of-this-world designs. This look in particular is a showcase that sometimes more is more, in a good way. Patterns, colors and textures clash in a single outfit, and the fact that it works is a testament to the brand’s mastery of the chaotic. The waterfall of scales smooth the transition between top and bottom. 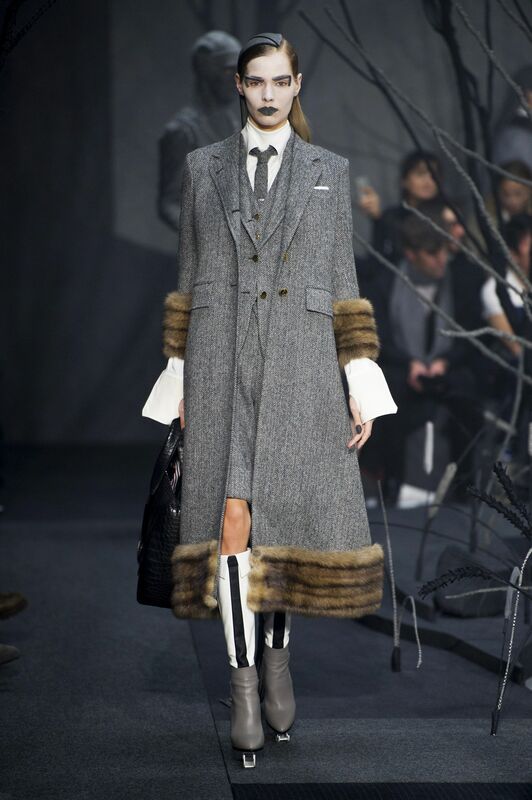 Thom Browne is a master of the technical aspects of fashion, and there was not a single piece of his fall 2017 RTW collection that didn’t exhibit methodical design. The collection was cold and beautiful in a nearly palpable way, like flowers dipped in liquid nitrogen. Shoes had ice skate-like platforms on their bottoms, and grey, angular and exaggerated lips and eyebrows created a look of dystopian cubism. The collection was severe, but this may be the best way to put Browne’s nearly authoritarian meticulousness on full display. This particular outfit puts fur next to fabric without ending up looking fit for a theatre prima donna, which is not as easy as it sounds (and if you don’t know how to sew, it already sounds hard. It gets harder.) This look lacks the calf-high socks and sock garters many of the other models sported, and while the rubbery look of the shoes isn’t ideal, credit is due to Browne for making a boot that looks like a button-down and tie. Marc Jacobs: You’ve probably heard of him. He’s certainly kept his name alive in the mouths of media outlets everywhere, and his fall 2017 RTW features several of the most talked-about models, including Adwoa Aboah, pictured above. Inspired by the documentary Hip-Hop Evolution, Jacob’s aimed to have his designs pay homage to hip-hop culture’s role in fashion around the world. Models wore minimal makeup, which made all the more room for attention to go to the hats. The cloches like the one on Aboah, which bring to mind fuzzy bucket hats of 90s hip-hop, were elegant next to the adorably puffed up beanies that followed them on the runway. 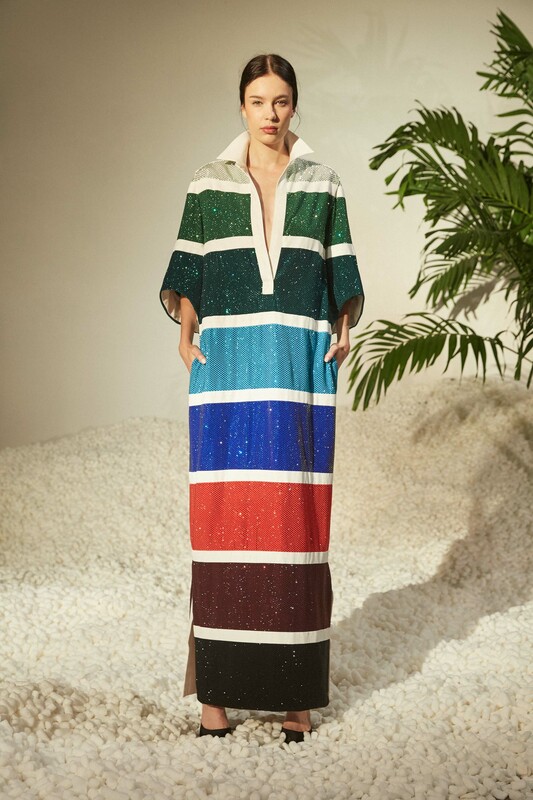 The Emilio Pucci pre-fall 2017 collection rings true to what the brand has been famous for since it first came to prominence in the 50s and 60s: kaleidoscopic colors and geometric shapes. In the typical Italian fashion, once you know something is good, you don’t stray too far from the original recipe. This collection in particular featured a lot of matador-like capes and jackets, one of which pops phenomenally in the look above. The thick canary-yellow ruffle pairs with the intricate floral print in a way that is both current and retro, a trend that interestingly is shared in many current trends in interior design. The pink tights and tiny, translucent black ruffle meet the bold, strappy shoe to make an excellent show of minimalist femininity. Another recent newcomer to the fashion main stage, Alena Akhmadullina founded her brand in 2001 and her designs take inspiration from Russian fairy tales. While she may not be a household name, her designs have been worn by the likes of Eva Green and Naomi Campbell. Many of the Alena Akhmadullina pre-fall 2017 pieces had a sleepwear quality to them, with silky robe and nightgown-cuts being pushed further into Sleeping Beauty territory with detailed embroidery of birds, fruits and wolves (all quintessential images of Russian fairy tales.) The look above is practically taking the REM dream-state out of bed with it in velvet slippers, and the rich blues recall the famous Russian artist (and one of my all-time favorites) Mikhail Vrubel, who often painted Greek mythological Daemons in shades of blue and purple. Did I miss anything spectacular (besides Ralph Lauren, I know, Ralph Lauren. But this post could go on forever)? What do you want to know about fashion? Engage with me in the comments, people! Or, share on your social media(s) so you and all of your friends can freely trash or laud my tastes. Show your girlfriends, show your moms, show your grandmothers. As fashion weeks continue across the globe, I’ll continue to spotlight some of my favorites.